The following example uses Keepalived in direct routing (DR) mode to implement a simple failover and load balancing configuration on two servers. One server acts as the master, the other acts as a backup, and the master server has a higher priority than the backup server. 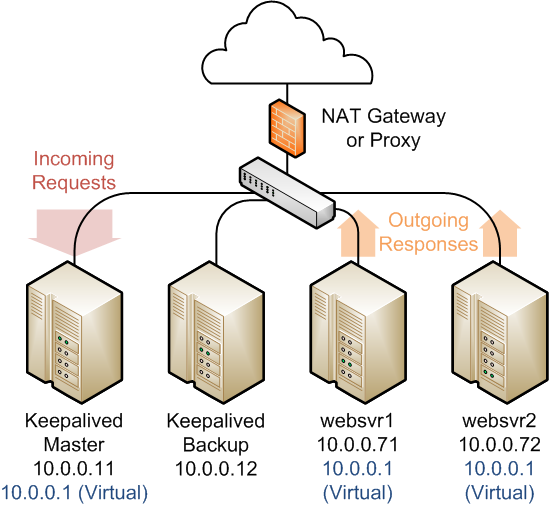 Each of Keepalived servers has a single network interface and the servers are connected to the same network segment (10.0.0.0/24) on which two web servers are accessible. Figure 17.4 shows that the Keepalived master server has network addresses 10.0.0.11 and 10.0.0.1 (virtual). The Keepalived backup server has network address 10.0.0.12. The web servers websvr1 and websvr2 have network addresses 10.0.0.71 and 10.0.0.72 respectively. In additional, both web servers are configured with the virtual IP address 10.0.0.1 to make them accept packets with that destination address. Incoming requests are received by the master server and redirected to the web servers, which respond directly. The virtual server configuration is similar to that given in Section 17.7, “Configuring Load Balancing Using Keepalived in NAT Mode” except that the value of lb_kind is set to DR (Direct Routing), which means that the Keepalived server handles all inbound network traffic from the client before routing it to the back-end servers, which reply directly to the client, bypassing the Keepalived server. This configuration reduces the load on the Keepalived server but is less secure as each back-end server requires external access and is potentially exposed as an attack surface. Some implementations use an additional network interface with a dedicated gateway for each web server to handle the response network traffic. Configure firewall rules on each Keepalived server (master and backup) that you configure as a load balancer as described in Section 17.8.1, “Configuring Firewall Rules for Keepalived DR-Mode Load Balancing”. Configure the arp_ignore and arp_announce ARP parameters and the virtual IP address for the network interface on each back-end server that you intend to use with the Keepalived load balancer as described in Section 17.8.2, “Configuring the Back-End Servers for Keepalived DR-Mode Load Balancing”.